In part one of this tutorial we will describe and illustrate several animation and graphics techniques while building an arcade game for Windows Phone 7. 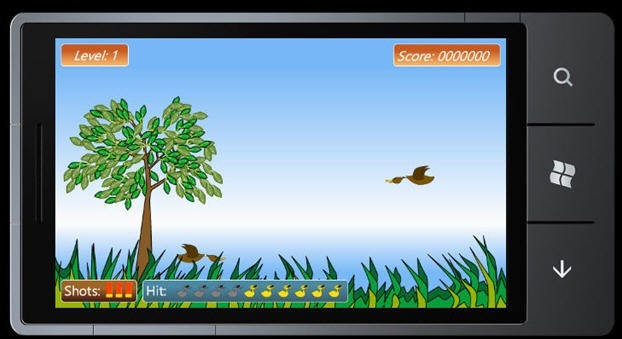 The game is called Bird Hunt, the purpose of which is to “shoot” birds flying across the screen by tapping the screen (no living birds were hurt in the creation of this game). Each time one or more birds are released on screen, the player has 3 shots to try and hit the targets within a certain amount of time. If ten birds are hit, the level advances. As the levels advance, the birds fly faster and become more difficult to shoot. The game is over when the player misses 10 birds. This tutorial was written with Jeff Paries, who created the game we’ll be using and who is the author of Foundation Silverlight 3 Animation . Artwork for the game and for the tutorial was provided by Ryan Loghry. 1) backgroundElements – the grass, trees, etc. The backgroundElements object contains a base canvas, which contains a canvas object named “backgroundObjects”. The backgroundObjects canvas contains canvases named “treeRight” and “treeLeft”, each of which contains a series of paths that make up tree objects. There are also a series of “grass”, “ground” and “stone” paths that make up the rest of the shapes in the object. The backgroundObjects canvas that contains all of the shapes in this object is scaled slightly along the X-axis to accommodate the application footprint. You can see this on the Scale tab of the Transform pane in Blend. The duck object contains all the shapes used to make the duck fly, react when shot, and fall. The duck object contains the usual LayoutRoot canvas, which contains a canvas called duckFlyingPoses. This canvas contains canvases with the duck drawn in wingsUp,wingsMid, and wingsDown positions. There is also the duck’s shotReactionPose which is shown upon a successful hit on the duck, as well as the duckFall1 and duckFall2 positions, which will be used to give the duck a “spinning” look as it falls. Finally, there are two elliptical paths – hitZoneBody and hitZoneHead. These are the areas of the duck that can be shot, and the events on these two shapes are used to determine if a shot successfully hits the duck. In viewing the duck.xaml file, you will notice that all of the poses for the duck are made to be non-visible by default by using the Visibility drop down on the Appearance pane. The poses will have their visibility manipulated by code, but if you would like to view the duck parts, select the appropriate canvas, and change the Visibility from Collapsed to Visible. Remember to reset the visibility back to Collapsed when you’re done exploring. Note that the duck object also contains 4 storyboards. The storyboards are used to make the duck fly, show the duck’s reaction when shot, show the duck falling, and to manage the duck’s quacking sound. The duckIcons object contains a LayoutRoot Grid, background Rectangle, TextBlock, and a StackPanel called iconsContainer. The iconsContainer StackPanel contains 10 Canvas objects, each of which has a rubber duck shape inside used to indicate the hit count. Each one of the rubber duck shapes contains paths named with a variation of “duckBody” and “duckbill”, which will have their Fill colors manipulated via code as the game is played. The levelControl object contains a LayoutRoot Grid, Rectangle, and a StackPanel with two TextBlocks in it. One TextBlock contains the “Level:” messaging, and the other will be changed via code to handle display of the current level. The MainPage control is where the main game controls are located. Inside of the LayoutRoot Canvas, there is a series of empty Canvas objects that are used to hold the scoring control, ducks, background elements, and icons. These Canvases will have objects written in to them, and serve the purpose of maintaining the desired Z-ordering of the different game elements. The MainPage object also contains the startPage, which is shown in figure 1, as well as some Grid objects called readyCanvas, niceShootingCanvas, and flyAwayCanvas. These Grids contain simple rectangles with game messaging such as “Ready!” and “Nice Shooting”. Finally, there is the gameOverCanvas, which contains some simple game over messaging as well as a Play Again button. The scoringControl object contains a LayoutRoot Grid object, which has a gradient-filled Rectangle for the background, a StackPanel containing a TextBlock for the “Score:” messaging, and a TextBlock to display the score value. The shotCounter object has a LayoutRoot Grid that contains a gradient-filled Rectangle for the background, a TextBlock for the “Shots:” messaging, and a StackPanel called “AllShells” which contains 3 canvas objects, each of which contains path objects to draw a shotgun shell shape. The red portion of each shell is named with a variant of “shellCase”, and will be manipulated via code to indicate spent shells as the user fires shots. Let’s begin by wiring up the the objects, and then we’ll put it together within the MainPage code behind to get the game running. Start Visual Studio 2010 and open the BirdHunt.sln file in the BirdHunt_Blank folder, and open backgroundElements.xaml.cs . Open duck.xaml.cs and add all of the duck behavior, from quacking to flying to, well to getting shot. We’ll add three more properties, to act as flags indicating whether a duck has been shot, if a duck has flown off screen, or if a duck is in “fly away” mode, meaning a user has fired and missed with all 3 shots, or the allotted time to hit the targets has expired. Empty Storyboards such as these are useful, as they raise a Completed event when they finish. This allows us to perform some action and conditionally restart the storyboard to repeat the desired action. Notice that setQuack is passed a string indicating which sound effect to use, and the duration of the quack is also parameterized. The RemoveDuck method is used to make the duck invisible after its death spiral is completed. Pay special attention to the penultimate line in which the Quack resource is disposed. Because this is not a managed resource it must be disposed of manually. Has the bird been shot? Is the bird in fly-away? Has the bird hit a boundary on the sky or the grass? Has the bird hit a boundary on either side? The first check is to see if the top of the duck object is <= 0, meaning the duck has reached the top of the screen. If so, the duck is moved to 0 Y, and the Y velocity is reversed by multiplying its value by -1. The second check looks to see if the top of the duck has gone beyond 350Y. This value allows the ducks to fly a bit beneath the top of the grass in the background object, but not to be obscured by flying beneath the ground visuals. If it reaches this value, the duck’s direction is reversed by multiplying Y velocity by -1. The third check looks to see if the duck is <= 0X. If so, the X velocity is reversed by multiplying it by -1. The other task performed here is to scale the duck object by -1X. This scaling effectively reverses the direction in which the duck is drawn. Finally, a check is performed to see if the duck’s current position plus the ducks width is wider than 800 pixels (the width of the game). The reason the duck’s width needs to be added to the current position is because Silverlight measures object positions from the top left. If an object has met this condition, it is positioned to be on screen, and scaled by -1X to reverse the direction in which the duck is drawn. the audio is stopped, and we ensure that the duck can not be shot twice (that would be cruel). Changing the IsHitTestVisible property to false makes the duck invisible to shot. A shot duck stops and its velocity drops instantly to zero and the duck shot reaction is started. The shotCounter object has several responsibilities, including tracking how many shots have been fired, playing audio files when shots are fired, and modifying the control visuals to indicate to the user how many shots remain, how many targets have been hit, etc. The WAV audio files needed for the game are already provided inside the project, in a folder called “sounds”. To play audio in the game, we will be leveraging the XNA Framework, so after double-clicking the shotCounter code-behind to open it for editing, add the following two using statements near the top of the file. These statements make the XNA libraries available to this object. The tracking of shots fired is managed by coloring the shell cases, much as the ducks are colored in the Duck Icon files. As it stands, you should be able to compile the code cleanly, although if you run it, there won’t be anything to see since we haven’t instanced any of our objects or created any code to run the game. In the next section, we’ll add the main code that brings all of these objects together and runs the game. This entry was posted in Essentials, Styles and Templates, WindowsPhone and tagged Animation, i2WTutorial, WindowsPhone, wp7Tutorial. Bookmark the permalink. Pingback: iPhone Developer? How to move to Windows Phone 7! | I Love Windows Phone!